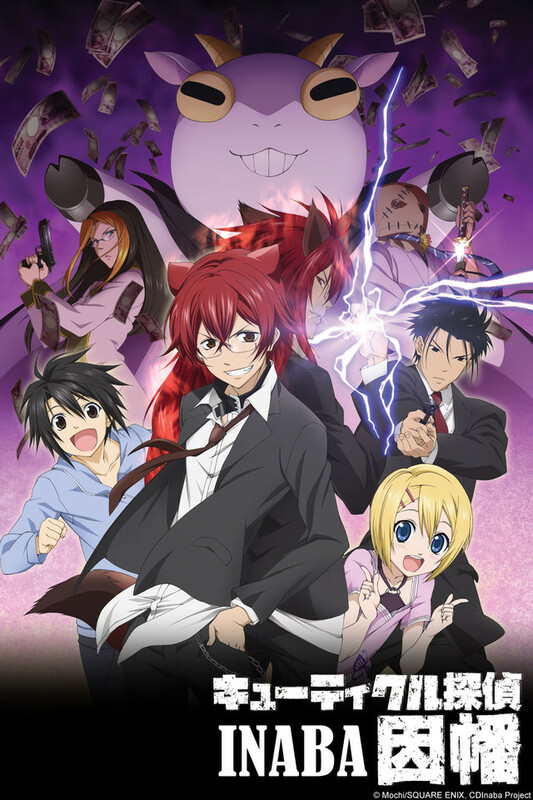 Featuring a cast of a retired-police-dog/werewolf, a yandere-male-cross-dresser, a very attractive police-officer who dotes on his daughter, and a pathetic, poor assistant by the name of Kei (the sole sensible character of this series), this anime has both great art, and is absolutely hilarious. The art style chages from chibis-to-attractive-full-size characters every second frame, as well as the mood changing from serious to gag 5 times in 5 seconds. Finally, so far there have been no hint of somewhat-useless, irriting, female characters, making this show a must-watch if you're looking for something to laugh at. Hilarious! it's full of weird scenes but very funny. The story revolves around Hiroshi Inaba, a genetically altered part human and part wolf being. Inaba is also a private detective, who runs his agency with the help his cross-dressing secretary, Yuta and his "mostly normal" teenaged assistant Kei. The plot mostly centers around the gang trying to arrest Don Valentino, a goat who literally eats money. Well, the first episode was like an acid trip. This show makes no sense, has no basis in reality and slams every series in recent history. In other words, it is pure comedy gold. But, check your brain at the door; it will just get in the way. Okay, four episodes in my initial impressions still stand but, the joke pacing has slowed a bit. Also, it looks like there is going to be a semi-coherent plot line developing. But, don't try and rationalize it. More than likely, the plot is going to be little more than a excuse to string episodes together. 1) do I like this anime? yes. 2) would I recommend this anime to people? yes but only people who enjoy comedy anime. 3)Would you watch this anime again? yes I plan on doing so soon. 4) Finally is this in you're top 5 anime list? sorry no but it is close because I did enjoy this very much. As there are only three episodes out, I've got very little content to form a well informed opinion on the series as a whole, but based on those three episodes I'd have to say that this show is an extremely silly but charming comedy with a lot of promise for those of us that enjoy non-traditional comedies. The characters are all a bit "colorful" (a werewolf/dog/human hybrid private detective with a hair fetish, a violently jealous transvestite, a detective who can double as an ultimate shield and spear and a mafioso who happens to be a goat), there doesn't seem to be a plot (it could be inferred to revolve on the main character's family troubles, but other than that there doesn't seem to be a plot point besides capturing the wily goat), and I'd have to say it's very similar to Gintama in this respect. The art and character design is great in my humble opinion. The characters themselves are all interesting and compelling. I'm really looking forward to watching new episodes. A show with crazy humor! One of my favorite comedy anime. I have watched this anime and bought the disc set about two years ago I believe, but now that I've noticed that it's present on Crunchyroll, I felt it was necessary to give my share of rating on it since I enjoyed the show so much. The humor and fast pace of this anime does become a bit overwhelming at times, but perhaps with a rewatch everything will become mostly crystal clear as to precisely what has occurred over the span of the series. With further examination, the show actually does have some serious tones, much like Kokkuri-san, which I would highly recommend if you enjoyed this series. Definite slapstick humor with not too much of a plotline, may be very fun to imagine a 'serious' version of if you are a writer or roleplayer like myself. Overall, a very interesting and unique cast of characters and fun ride that is never dull. If you're expecting a plot with a whole bunch of background information and a random plot twist in every episode out of this anime turn back now. Cuticle Detective Inaba quickly introduces key characters and their relationships in a way the viewer can follow. With an art style that is both similar and different to that of other recent animes (with the added chibi popping up every few frames) CDI has a refreshing sort of humour that may not be appropriate for younger children but is not vulgur at all. The gags which make up about 99.9% of each episode are new and not easy to predict (or maybe they are easy to predict but I just wasn't able to catch on). You will find that CDI has the air of one of the silly shows we all watched as kids that didn't really develop any plots but made us laugh out loud and love the characters all the same. All in all, if you've come looking for something to brighten up your day or you're just bored then Cuticle Detective Inaba is right down your alley!! This show is definitely not for everyone, but it's hilarious in it's own way and doesn't seem to take itself seriously--something I enjoy. The humor is strange, too strange for a lot of people, but if you're into something a little weird I highly recommend checking this one out. Need a What on earth did I just watch?? moment? Later on in the series however, there is a hint of darkness and seriousness that pulled me into the story and wanting to know more about the secret doberman program. I found it enjoyable and a good pick-me up when I am sad or semi- broken by other anime's plot twists. I really hope there is a second season!